Every year PlanSmart NJ holds an Annual Dinner to celebrate accomplishments in the planning field. At the Dinner we honor individuals or organizations that have promoted smart growth initiatives by presenting a series of awards. Our awards are designed to draw attention to achievements in regional planning, the economy, and the environment, while reducing disparities among communities through regional equity and reducing public costs through efficient use of resources. The Annual Dinner Resource Book includes descriptions of our awardees, our projects, and our Board. The ads show our broad base of support. Large suburban office parks and office campuses, that for many communities have been a significant part of their ratable base and prestige, have become “stranded assets” that are obsolete, vacant, and difficult to market. Likewise, shopping centers, particularly community shopping centers, have been underperforming for decades, with vacancies and lack of maintenance contributing to a sense of community decline and blight. The loss of ratables is putting a strain on county and municipal property taxes and is hindering the State’s ability to rebound from the recession. PlanSmart NJ’s Guide to the Future is the product of a year-long comprehensive statewide analysis of demographic and real estate data and evaluation of best practices and case studies. The user-friendly is a resource for local officials and those that advise them to describe the fiscal impacts stranded assets have on communities and how repurposing can solve the many problems that arise from underperforming corporate campuses and retail sites. 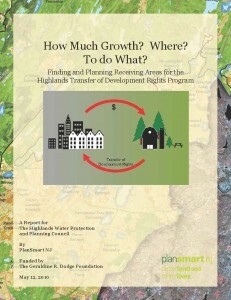 The Guide describes how communities can benefit from turning obsolete sites into functional, fiscally sustainable, and environmentally resilient assets. Recognizing that there is no one size fits all solution, recommendations are sensitive to the existing community fabric and range from walkable mixed use neighborhoods to single use repurposing. The project is guided by a steering committee of policy makers, business leaders, and local decision makers to ground the work in reality. The New Jersey Chamber of Commerce and PlanSmart NJ have conducted a collaborative research project to explore the concept of Regional Innovation Clusters (RICs), a theory that is explicitly promoted as a means to achieve targeted economic growth in various state level economic development initiatives. To be successful, the appropriate infrastructure and investment priorities to support these growth industries must be available. The report documents the relationship between New Jersey’s industry clusters and the state’s existing infrastructure to evaluate how infrastructure investment and economic development align on the ground. Please click here to see past publications in our Archives.